GRILL DIRECTIONS: In small bowl, combine all ingredients except salmon and lemon-pepper seasoning; mix well. Place salmon in shallow nonmetal dish; pour lemon mixture over fish. Let stand at room temperature for 30 minutes to marinate. Meanwhile, heat grill. 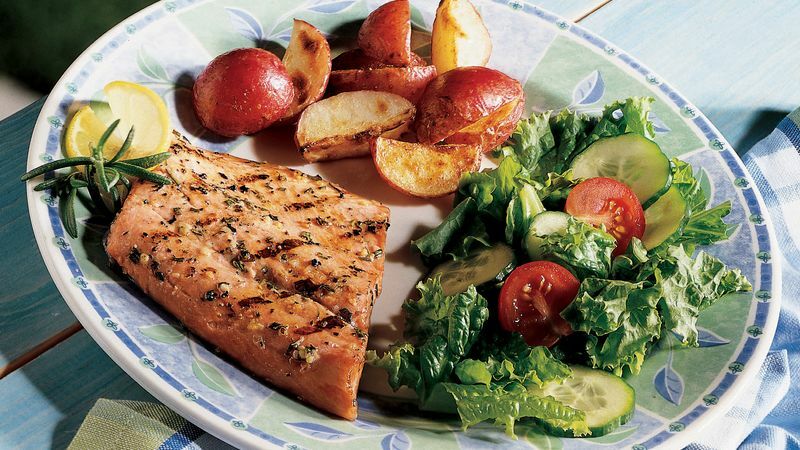 When ready to grill, remove salmon from marinade; reserve marinade. Place salmon on gas grill over medium-low heat or on charcoal grill 4 to 6 inches from medium-low coals. Sprinkle salmon with 1 teaspoon of the lemon-pepper seasoning; cover grill. Cook 4 minutes, brushing occasionally with reserved marinade. Turn fish; sprinkle with remaining 1 teaspoon lemon-pepper seasoning. Cook an additional 4 to 8 minutes or until fish flakes easily with fork. To broil, place salmon on broiler pan; broil 4 to 6 inches from heat using times above as a guide. How do you get the most juice from a lemon? Try microwaving the lemon on HIGH for 10 seconds or roll the lemon back and forth on the kitchen counter, pressing firmly before cutting it to extract the juice. Rub a little lemon juice on your fingers to neutralize garlic aroma, then rinse and wash with soap and water. This lemony fish goes well with Seasoned Grilled New Potatoes and a tossed green salad.